Pulsed lasers enable photomanipulation of various structures within tissues and cells, even down to the molecular level, as well as the interference with cellular processes. The selective laser cutting of cellular structures like microtubules or the removal of whole cells by ablation permit to study cell and developmental biology. 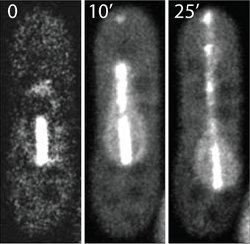 This technique provides new insights into the architecture of the mitotic spindle, the process of chromosome segregation as well as cell locomotion. Furthermore, it gives new information about origin, fate, or function of individual cells in the developing organism and can also be used for gene activation. As a primary advantage, laser-based cutting / ablation is a very flexible method that can be performed at any cellular site, in any cell pattern and at any time in development within living tissues and cells. It reaches submicrometer resolution thus allowing to target specific cell organells. The ablation efficiency depends on the fluorecent label. Efficient ablation requires pulsed laser excitation to reach high peak intensities with moderate average power. In this way, cell damage is minimized in untreated regions. In addition, the heat generation is significantly reduced due to the short pulse duration. Thus, by using pulsed laser light, the necessary ablation illumination times are very short without causing visible collateral damage. Direct connection of one laser to the SIM scanner. This configuration is usually used for laser cutting with pulsed excitation at 375 nm or 405 nm. It enables to micromanipulate living cells or tissues and simultaneously analyze the consequences via imaging. Connection of several pulsed lasers to the SIM scanner. This allows for synchronous laser cutting / bleaching and uninterrupted, fast live cell FLIM imaging. This setup requires suited ADM beamsplitters for the overlay of the SIM and main beam path in the LSM. In this way it is possible to photo-manipulate one region-of-interest (ROI) and measure FLIM in another area when the excitation is carried over larger distances. A third configuration uses pulsed diode laser at 375 nm or 405 nm that are coupled to both SIM and standard scanner. This is realized by using a dedicated switching option in the PicoQuant Laser Combining Unit (LCU) along two fibers. The LSM FluoView software allows to activate the pulsed lasers and to adjust the scan range. Confining the scanning or bleaching area to a defined ROI requires an exact timing of the PicoQuant pulsed diode laser, which is realized by externally gating the lasers (i.e. switching “on” and “off”) on a nanosecond time scale. Thus, the pulsed lasers excite the sample only within the ROI, avoiding photo damage in other regions of the sample. 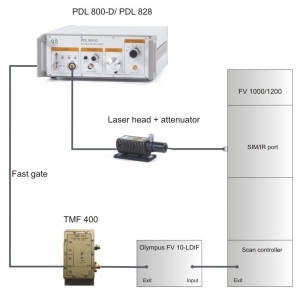 In order to integrate the gating option of the pulsed lasers into the Olympus FV1000 / FV1200 setup, special electronic modules were developed by Olympus and PicoQuant. 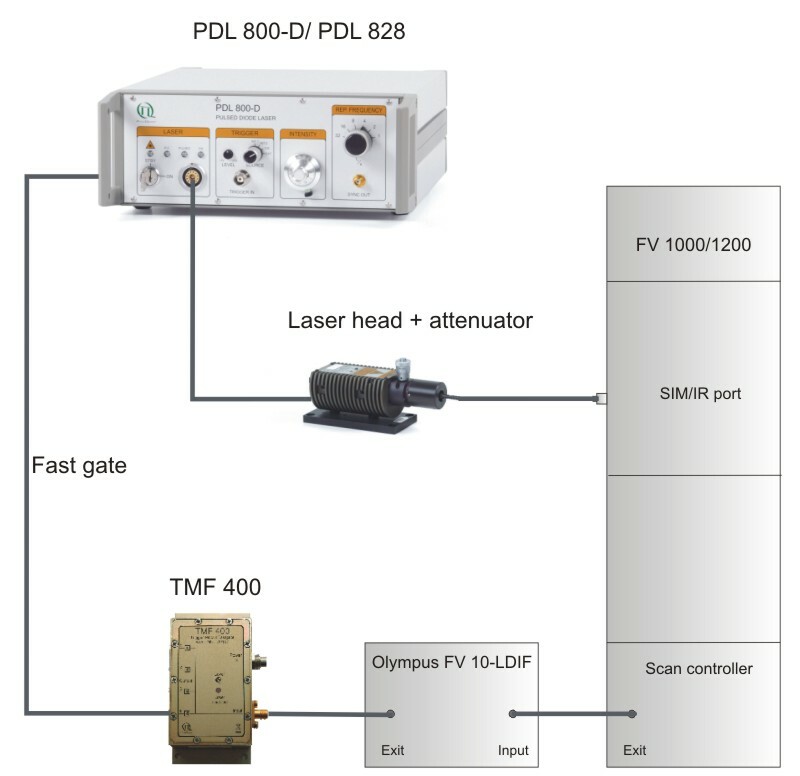 Using the Olympus external laser control module FV10-LDIF and the Trigger Module Fastgate TMF400, the fast gating can be precisely controlled by the Olympus LSM software laser management system allowing for gating times of less than 10 ns, i.e. in between two laser pulses. Picosecond pulsed diode lasers are standard excitation sources for Fluorescence Lifetime Imaging (FLIM) and Fluorescence Lifetime Correlation Spectroscopy (FLCS) in conjunction with Laser Scanning Microscopes (LSMs) such as the Olympus FluoView FV1000 and FV1200. In addition, they are a very effective tool for selective photomanipulation of the specimen. Thus, the LSM Upgrade Kit allows for FLIM, F(L)CS as well as laser cutting / ablation and combines PicoQuant products to a ready-to-use kit that fits to your specific applications. 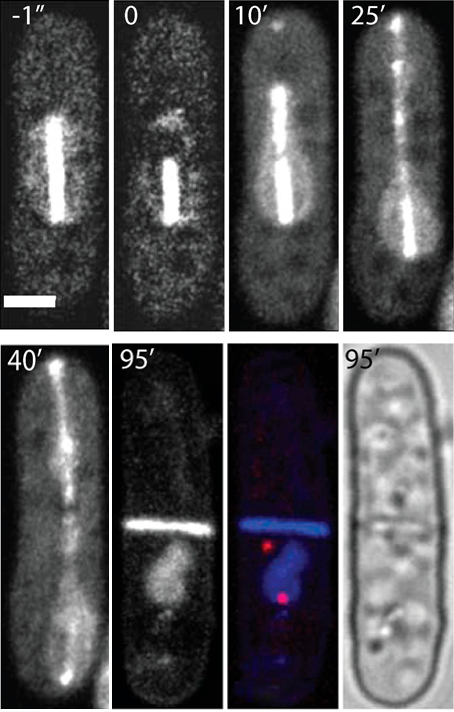 In this example laser ablation was used to manipulate the mitotic spindle in yeast. The mitotic spindle plays a key role in eukaryotic cell division and is the driving force for proper chromosome segregation. The spindle exists of microtubules that are connected and pulled towards the spindle poles. The EGFP labeled spindle was illuminated in its center which is the overlap zone of microtubules growing from the opposite spindle poles. Using moderate pulsed laser intensities at 405 nm, the structure was photobleached. The bleached parts moved apart as the spindle continued to elongate normally resulting in two bleached spots along the spindle. Higher laser intensities led to a complete breakage of the spindle microtubules. For this purpose, the spindle midzone was irradiated with a pulsed 405 nm laser for 2 seconds (“tornado scan”) at a frequency 40 MHz and with an average intensity of 0.4 mW. The spindle was separated into two segments that moved towards each other resulting in an x-shaped pattern of two crossed spindle fragments. Occasionally, the two strands reconnected and the spindle elongated (not shown) whereas in other cases both fragments elongated without reconnecting. The aim of this approach was to produce and analyze enucleated cells. 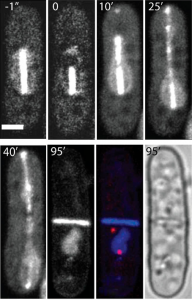 This technique permits to study the cytoskeleton in a nucleus-free environment as well as the role of the nucleus during cell growth. Furthermore, the protein turnover can be examined after enucleation. For this purpose, the spindle close to one pole was asymmetrically ablated via pulsed laser irradiation at 405 nm during cell division. Only the longer spindle fragment continued to elongate which resulted in moving the nucleus towards one side of the cell. Consequently, after cell division, only one daughter cell contained the complete nuclear DNA whereas the other one was enucleated. This noninvasive method of enucleation have proved to be efficient and reproducible and worked for about 60% of all ablated cells. The enucleated cells were still growing even 8.5 h after ablation allowing to study e.g., the protein production.